The Alien Bestiary is a 3rd Party alien archive for Starfinder. Adding more than 300 monsters, you’ll find a menagerie of monsters for any occasion for your Pathfinder games, including new starship-creatures. There’s a new monster manual in town. Well, in space. And they’re not monsters, technically, they’re just alien beasts. But you can find a whole lot in the Alien Bestiary from Legendary Games. If you’re looking for villains, foes, or things to just keep your players on their toes, this book has got you covered. Find traps and hazards alongside massive aliens. Take a look! 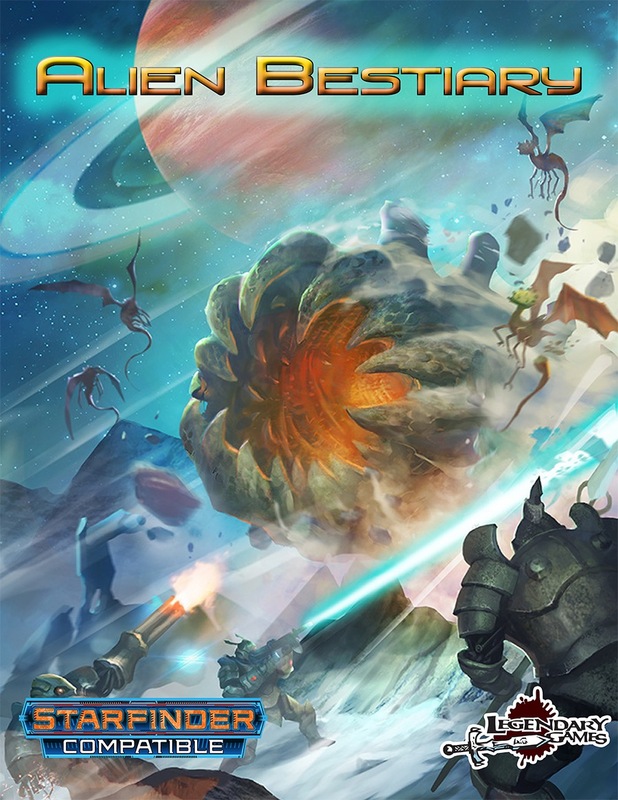 The Alien Bestiary brings you an incredible array of sci-fi and space-themed monsters and menaces for the Starfinder Roleplaying Game! The creatures you’ll find within are perfect for whenever your heroes venture into the dark tapestry of space or have to defend their home from alien invasion by eldritch horrors from beyond the stars, whether you use the official Starfinder setting, a universe of your own design, or a dedicated sci-fi saga like the Legendary Planet Adventure Path or an interplanetary campaign set among the stars like the Aethera Campaign Setting! You’ll find allies and adversaries within these pages, from playable races for your sci-fi game to cosmic horrors and apocalyptic enemies inspired by classic themes of science fiction. This volume collects nearly 300 monsters from CR 1/2 to CR 30, including template grafts and starship-level creatures from tier 4 to 18! You’ll find denizens of the Legendary Planet and Aethera settings, Starfinder versions of classic creatures like the myrmidon robot, plasma ooze, and star-spawn of Cthulhu, alongside brand-new never-before-seen monsters like the asteroid worm, star fairy, meteor dragon, and supermassive singularity! Don’t let your Starfinder Roleplaying Game campaign get lost in space or just be a trek among the stars, grab a copy of this incredible 440-page monster accessory today and Make Your Game Legendary!